Sri Soedewi orchid garden is located on Jalan Ahmad Yani, or in front of the governor's office of Jambi. These tourism attractions provides any information about orchid care that good and perfect in accordance to each type of orchid. This tourist attractions is most visited from Jambi or outside the city. 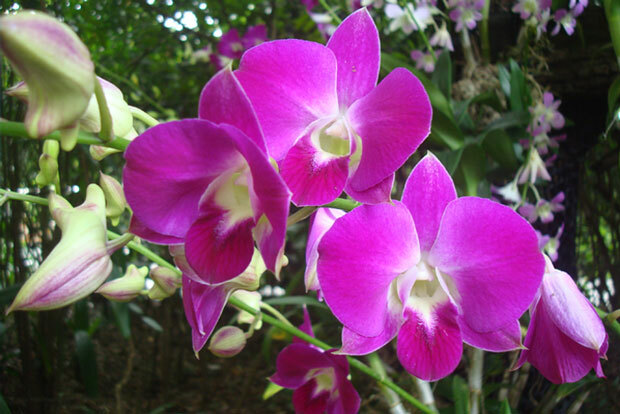 You can find more than 60 varieties of orchids in the garden that covered an area of 2.5 hectares. To be able to see these beautiful flowers, you will be charged Rp. 2,000 for adults and Rp. 1,500 for children. After enjoying the garden, you will not go home with empty-handed, because there are flower seeds were given away for free for you to be taken home. After receiving information about how to take care for orchids properly, you can practice at home with the seedlings. The location of Sri Soedewi orchid garden is on Jl. General Ahmad Yani, Telanaipura sub- District, the Jambi. To go to the location, you can use private vehicles or public transportation that available in the city of Jambi. For those of you who use private vehicles or your own car, you do not need to worry, because the location of this park is not difficult to be found, for the location is not too far from the city center, or it only 4 kilometers from Jambi city center. If you are coming from the eastern highway of Palembang-Jambi, you will find the intersection between Jl. Pattimura and Jl. Lingkar Barat 3, then you must follow Jl. Pattimura, until you find Jl. R.E. martadinata. once you find Jl. R.E. Martadinata, you just go along this road until you find Jl. Gen. Ahmad Yani. Then, once you arrive at Jl. General Ahmad Yani, you just looking for a bit of the location.